Legend has it that when Subramanya killed the demon Tarakasura, the Shivalingam in his throat broke and fell in five different spots, which became the Pancharama kshetras. The foremost of these is Amareswara at Amaravati where Indra and the Devas are believed to have worshipped Shiva. The others are Draksharama, Kumararama at Kotipalli, Bheemarama at Samalkota and Ksheerarama or Palakollu. 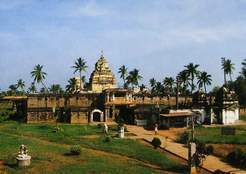 Some beliefs refer to Amararama, Draksharama, Somarama at Bhimavaram, Bhimarama or Kumararama at Samalkota and Ksheerarama at Palakollu as the five Pancharama Kshetras, while some even refer to the Chalukya Bhimeswara temple at Bhimavaram as Bhimarama. It is believed that the Shivalingam that shattered into five pieces was a huge one, and the biggest of the five pieces is a fifteen foot long column of white marble which is worshipped as Amareswara at the Amaravati temple (this is very similar to the ten feet high Shivalingam at the Draksharama temple). Yet another legend links the pancharama kshetras. The five Shivalingams worshipped at these shrines are said to be a part of a single Shivalingam said to have been created by Surya or the Sun God. This original Shivalingam is said to have been held in worship by the seven rishis - Kasyapa, Atri, Gowtama, Kousika, Bharadwaja, Vasishta and Jamadagni. These rishis are believed to be present in the seven tributaries of Godavari, of which the Bharadwaja, Kousika and Jamadagni Godavaris are not in existence anymore. It is believed that the seven rishis brought water into the Godavari river from their points of origin. It is also believed that the waters from the seven tributaries constitute the water sources in the temple tank. As the name Amaravati implies, legend has it that Amaravati was once the abode of the Gods - the Devas, the yakshas and the kinnaras, who performed penances to Shiva to request him to rid the earth of the mighty demon Tarakasura. Legend has it that Shiva's son Subramanya vanquished the demon.It is believed that the Shivalingam that shattered into five pieces was a huge one, and the biggest of the five pieces is a fifteen foot long column of white marble which is worshipped as Amareswara at the Amaravati temple (this is very similar to the Shivalingam at the Draksharama temple). Legend has it that it was installed by Indra the king of the Devas, Brihaspati the guru of the Devas and Sukra the preceptor of the Asuras. Lord Amareswara temple at Amaravati is 30 km from Vijayawada and 35 km from Guntur. This city is famous for its art and culture. The temple of Lord Amareswara located on the banks of river Krishna, is rich in Dravidian and Buddist architectures. The Lingam is 15 feet high, carved out of marble. The city was named Amaravati after Indra's capital here. Tradition says that Indra and Devas had worshipped the Lord here. Goddess Shakthi is worshipped as Bala Chamundika Devi. Amereswara Swamy Temple at Amaravathi is one of the Pancharamas formed from the broken pieces of Siva Linga of Tarakasura. The Linga was installed by Devendra at the instance of his Guru Brihaspati. Though it is existing from Vedic age, historical evidence from the inscriptions indicate that royal families visited the temple and offered prayers during 500 B.C. Evidence of the visit of Raja Vasi Reddy, Venkatadri Naidu, Sri Krishna Devaraya, and Satvahanas is also inscribed who donated liberally, for the improvement of the Temple. The white Linga is quite unique and the priests have to ascend the steps for offering abhishekam. DRAKSHARAMA is situated at a distance of four miles from Ramachandrapuram, which is a Taluk headquarters of East Godavari District of Andhra. One can reach it either from Rajahmundry or from Kakinada by road. The place is very famous as the seat of a temple of Bhimeswaraswami. The temple is noted not only for its architectural beauty and historical importance, but also for its sanctity and holiness and attracts pilgrims in thousands every year. Draksharama is also called as Dakshina Kasi or the Southern Banaras. Vedavyasa is said Goddess Manikyamba Bhimanatha to hav e founded this temple, and the Ravi tree and Lingam said to have been founded by him, are still shown. Within the temple is a curious well, the mouth of which is in the shape of a strung bow. It is called the Rudra Tirtha and a Lingam at the site of the Western gate is said to be making a daily pilgrimage to Banaras. Right at the main entrance of the temple, there is the image of Ganapati, who has been praised by devotees as the fulfiller of the wishes and desires of his Bhaktas. There is also here a Navagraha shrine and the shrine of the Ashta Dikpalakas in the eastern Mukha mantapa. There is also in the temple a Vigraham of Sri Lakshmi Narayana Swami. This is said to have been installed by Sri Ramachandra as theKshetrapalaka. It is generally believed that a Divya Sthala becomes a Punya Sthala, only when there is a Vishnu image in Sivalaya, and a Siva image in Vishnalaya. Hence, the importance of this. Someswaram or Kotipalli (Kumararama) is an important pilgrimage center in coastal Andhra Pradesh, located near Rajahmundry. Located nearby is Drakshaaraama, one of the five well known pancharaama shrines dedicated to Shiva in Andhra Pradesh. Koti Palli or Koti Theertham is located at confluenece of the river Godavari with the sea. At the origin of the river is the Tryambakeshwar Jyotirlinga shrine in Maharashtra. The river Godavari is revered as one of the gifts of nature and is held in great regard both at its origin Triambakeshwar and at its confluence with the ocean. Thus, worship at Someswaram or Kotipalli is closely associated with a ritual bath in the river Godavari. Someswaram is rich in legend and tradition. Shiva is worshipped here as Someswara or Koteeshwara and Parvati as Rajarajeswari. The Mahasivaratri festival is celebrated in great splendour here. Legend has it that the moon God Chandra was cursed by Daksha to lose his brilliance and that he was relieved of his curse after he offered worship to Shiva at Koti Theertham at the mouth of the river Godavari. This legend is very similar to the one held at Somnath Jyotirlinga shrine in Gujarat. It should also be noted that Draksharama - one of the pancharaama shrines, is associated with the legend of the destruction of (the vain) Daksha's ritual sacrifice. For time immemorial it has been believed that a ritual bath in the river Godavari at Kotipalli is symbolic of a new beginning in life, a change in direction. Legends illustrating this symbolism have a common theme, that of forgiveness of heinous sins committed by repentant souls. The most classic of these legends is that of Ahalya-Indra saapa vimochanam. This legend occurs in the grand epic Ramayana. Gowtama believed to be one of the foremost rishis of ancient India was married to Ahalya. Indra the king of the Devas lusted after Ahalya and using a ploy, diverted Gowtama and assuming the disguise of Gowtama led Ahalya in his embrace. An enraged rishi cursed his wife who petrified into a rock immediately and was absolved of her curse by Rama (incarnation of Vishnu). Indra the king of Devas was cursed with a life of disease. Legend has it that he lived through his curse and performed severe penances (at the instance of Gowtama rishi) and finally was absolved of his curse and forgiven when his penance concluded with a ritual dip in the Godavari river at Someswaram. It is to be known that the one of the characters in this legend, i.e. Gowtama Rishi is believed to have brought the river Godavari down to the earth at Tryambakeshwar where the Godavari is referred to as the Ganga. There are several other local legends associated with Kotippalli, all based on the theme of forgiveness of sins of lust. A ritual bath in the river is considered special in the month of Kartika, and on Mahasivaratri day earlier on in the calendar year. It should be noted that Bhimavaram in West Godavari district also bears a temple dedicated to Someswara and it is also considered to be Somaramam. This temple is of historic significance as it was patronized to a great deal by the Chalukyas. This temple is associated clearly with legends related to the moon God Soma. The temple tank here is known as Chandra Pushkarini. The Someswara lingam (crystal) is said to glow with differing levels of brightness depending on the phase of the moon. 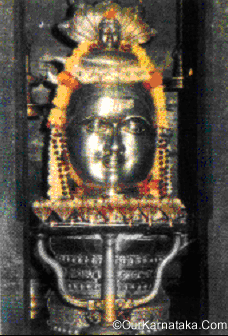 Ths Shivalingam is 5 feet in height and is housed in a two storeyed sanctum, with Annapurna - Parvati on the 2nd floor.